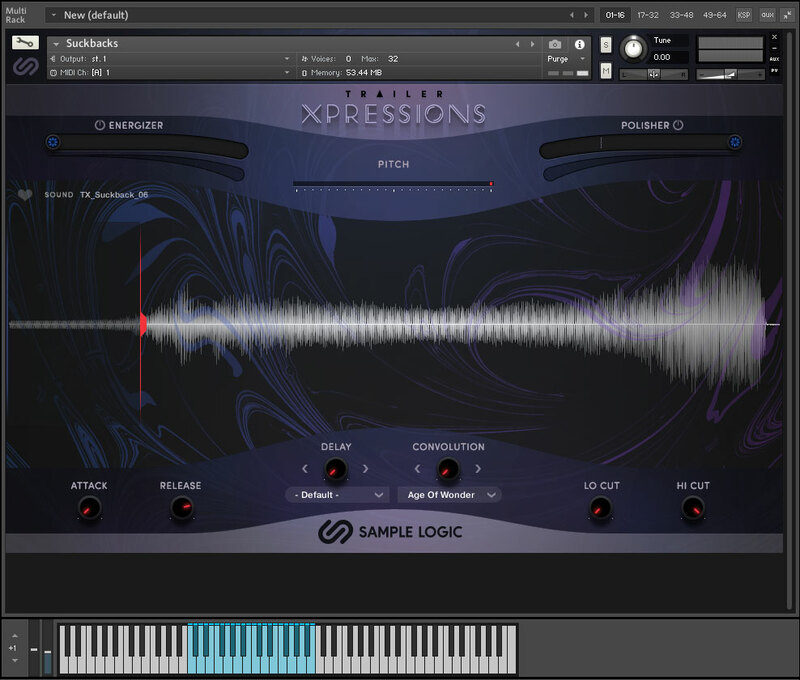 Sample Logic’s Trailer Xpressions – what is it? Trailer Xpressions contains a collection of over 1000 samples designed for Trailer and Cinematic music production, for Native Instruments’ Kontakt 5. 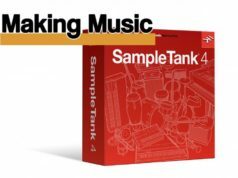 It requires the full version of Native Instruments’ Kontakt sample player versions 5.6.8 or higher and needs at least 4.2Gb of free disk space for the installation. If you’re anything of a movie lover, you’ll enjoy watching trailers almost as much as the main features. Trailer production has become an art form, slightly distinct from movie production itself and this is nowhere more apparent than in the music. Action trailer music, for example, is big, bold and brassy, very dynamic and exciting. There are typically lots of impact sounds, whooshes, drones, bangs, scrapes and non-standard percussion. 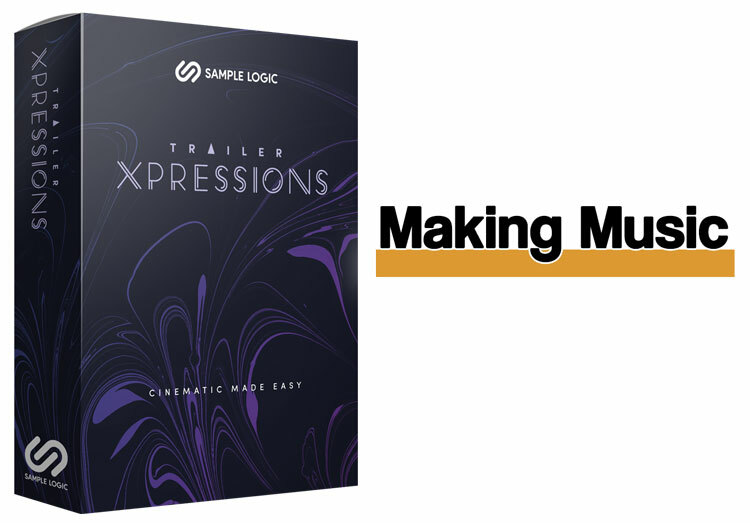 These are often custom-made for the movie but if you’re not working on mega-budget movies, Trailer Xpressions gives you an affordable set of highly-customisable sounds that will fit right in to most trailer music and, of course, into cinematic scores, too. The sounds are divided into two main sections, Ambience and Percussives, which contain between them 26 Kontakt instruments, and because we have space on the internet to list them all, we’ll do just that. As well as using the sounds generated from within the user interface, the license agreement also gives you the right to use the individual waveforms so you can import them and edit them in your DAW or editing software. Nice one, Sample Logic. Each instrument contains several samples and each key on the keyboard triggers a different sample. When you press a key, the name of the sample is shown, making it easy to find individual samples to drop into your DAW. The sample’s waveform is also shown and a playback line moves through the waveform as it plays. You can mark samples as favourites to make them easier to find and they appear on the keyboard as a red key. Most the categories are self-explanatory but let’s take a look – and listen – to some which may not be immediately obvious. The manual does say that the categories were devised by the programmers and, obviously, sounds like these can be very difficult to put a name to, so you need to allow for a little license. The Stingers, for example, are not bangs but mainly atonal, with a slight electronic, metallic ambience. Think alien spaceship interior. Most of the Noises are slightly less-tonal and many evolve for longer. Moving on to the Percussives, the Brams are interesting. Brams (or Braams or even Braaams) are often described as very low-pitch brass with a foghorn effect. You want an earth-moving sonic carpet – you want a Brams. Many of the Brams here give you that low rumble. Several have a noise content but you can remove it or tone it down with the filter (coming up). The Downers, as you might expect, generally sweep down in pitch and many evolve into an atmospheric drone. The Risers are the opposite and, er, rise up, usually in both pitch and volume, often with a lengthy build up. There are some beautiful samples here. TX_Riser_08 is one of my favourites; a slow high-pitched tone which remains steady while the ambient background noise rises, resolving into a glorious, sonorous reverb-spring-like crash that slowly fades. I know, that description didn’t do it justice. The Hits are generally short while the Impacts take longer to get to the point; the difference between hitting something with a large but manageable object and two planets colliding. The Pulses often repeat the same sound but some are rhythmic. They also sync to the tempo of your DAW so are suitable for looping. I’m not clever enough to work out what the Reverses are the reverse of but you can load the wave files into your DAW and reverse them to find out. There are only seven samples in this category but, of course, you can load any of the 1000+ samples into your DAW and reverse them, too! The Suckbacks are similar to Reverses but most have a longer build-up time and not all end abruptly. Okay, so enough of trying to put into words what can only be understood by listening. As well as the raw samples, which are what we’ve been describing, there are also several edit and manipulation functions. 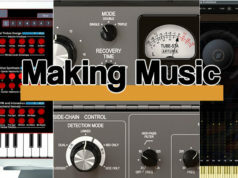 You can move the starting point of the sample and assign this to a MIDI Controller for easy adjustment. The start position is applied to all the samples in an instrument so it’s a setting you’d want to adjust on a sample-by-sample basis. 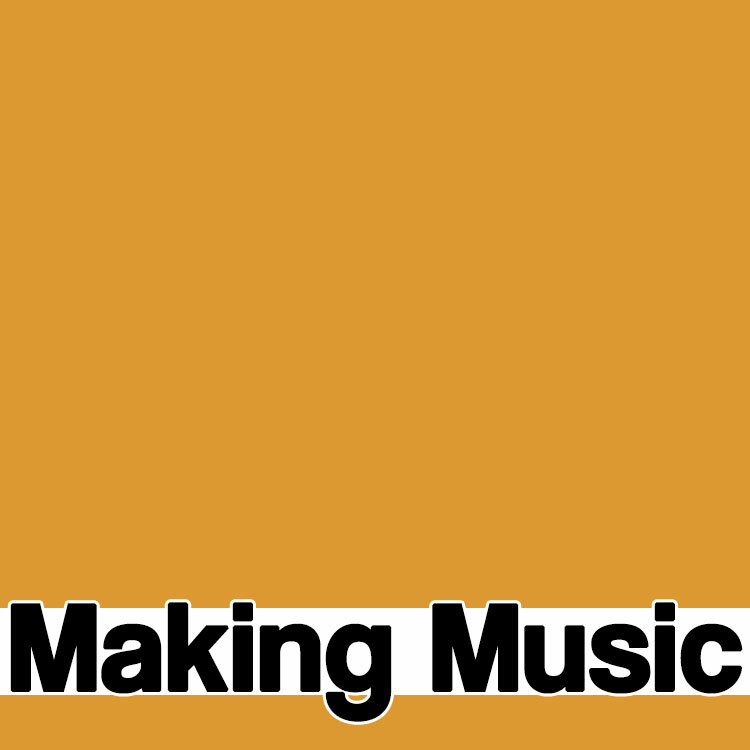 You can also change the pitch and assign this to a MIDI controller, too, and adjust it live. You can easily create some brilliant effects by adjusting the pitch as the sample plays. This more than doubles the sonic potential of many of the samples. You can adjust the attack and release of a sample to create fade ins and outs. Again these work on an instrument rather than a sample basis. 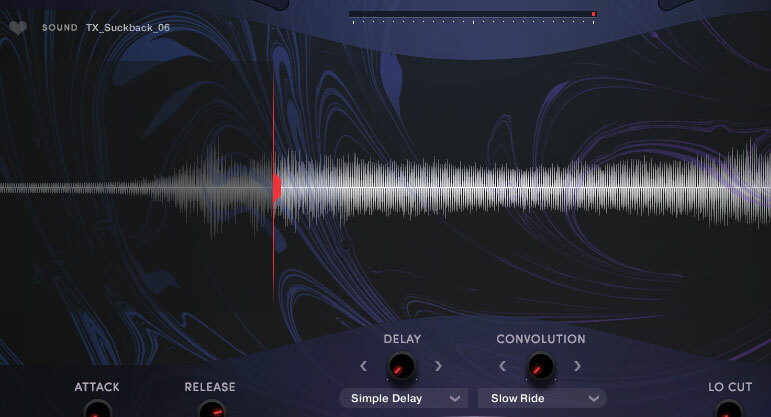 You can change a sound’s position in the stereo field, tweak hi- and lo-pass filters, and adjust a stereo delay effect which has several delay presets. There’s a convolution control with several presets which adjusts the balance between the original sample and an impulse response. It’s sort of like a reverb but not quite. But yet another way to adjust the sound and useful for changing its position in the mix. The energiser is a combination of compression, saturation and distortion. The polisher is a mastering effect that combines EQ, saturation, transient enhancement and stereo imaging. These are On or Off controls with an adjustable amount setting and their effect is more apparent with some samples than others. All these give you added control over the samples from within the interface making it easy to customise a sample with a nip and a tuck. 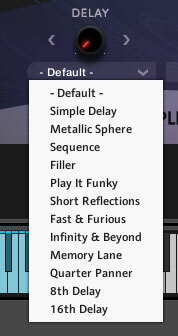 They are tweaks rather than edits but, thanks to full access to the original samples, you can process and edit them in your favourite DAW as much as you wish. The program is very intuitive to use and it’s so easy to lose yourself in the plethora of amazing and wonderful sounds and atmospheres. There are hundreds upon hundreds of samples here that shout Epic on a grand scale, and yet others which could sit in the background to add a little atmosphere. 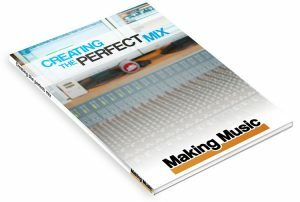 If you want a sound to underscore a scene or form a backdrop to a piece of music, you’ll find it in Trailer Xpressions.